Tooth staining is an unpleasant reality that comes with getting older. So why would your toddler be going yellow? There are many factors that contribute to tooth discoloration in kids, from consumption of certain fruits and vegetables to less-than-stellar brushing. That doesn’t mean your daughter shouldn’t load up on healthy blueberries – just offer a glass of water or a naturally tooth-cleaning food, like apples, afterward. Straws come in handy to deflect the effects of staining beverages, and as always, keeping ‘em brushing twice a day helps maintain a bright smile for years to come. Early tooth decay. Teach them to brush and floss from an early age. Inadequate dental hygiene is a common source of plaque formation and yellowing. Soda. Over time, the acids in soda are known to cause tooth erosion, making the kids’ teeth more susceptible to staining by the dark compounds in cola and root beer. Medications. Certain antibiotics and antihistamines may cause discoloration in the kids’ teeth. A child whose mother took certain antibiotics, like tetracycline, during pregnancy, may be born with tooth discoloration. Fruit juice. Dark-colored juices like cranberry and grape contain pigments and high amounts of sugar. Popsicles. You’ve seen the darkening of the kids’ teeth, lips, and tongue immediately after they’ve enjoyed one of these cold treats. 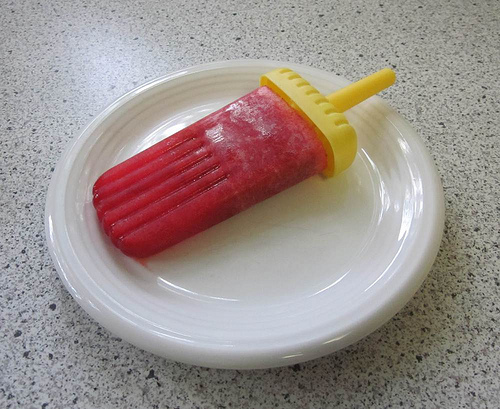 Keep in mind that the dyes in popsicles work their way into the pores of their tooth enamel, too. Multivitamins. The iron contained in multivitamins causes a very small percentage of children to develop a dark stain on the teeth. Tooth Injury. When trauma to the tooth reaches the gums, the tooth may turn a permanent grayish color. Fluoride consumption. Abundant consumption of fluoride in tap water or toothpaste may cause some brown spots or white streaking. Jaundice. Newborns with jaundice may develop a greenish tint to their teeth. Illness. Sometimes, tooth discoloration is the result of more serious illnesses, like recurring infections or heart disease. Genetics. Babies born with weaker enamel have teeth that stain more easily. Food flavoring. By a certain age, tots enjoy the same foods their parents do, like salads dressed with balsamic vinegar or rice drizzled with soy sauce. These sticky, pigmented flavors may contribute to tooth discoloration, along with everything from tomato sauce to curry. Fruits and vegetables. Blueberries and beets are certainly good for you, each containing plentiful amounts of beneficial vitamins for the little ones’ smiles. They are also richly pigmented and contribute to tooth staining. Hot beverages. You’ve noticed the effect of hot water in the shower – it opens up the pores. The same goes for very hot beverages on the teeth. This opening of the tooth enamel’s pores contributes to degeneration. Wait until the cocoa’s lukewarm. Cold beverages. Very cold drinks essentially have the same effect as hot ones. The best bet is to keep things cool.